Graeme Kent's Sister Conchita and Sergeant Kella series, published by Soho Crime in the U.S., has a unique location (the Solomon Islands 15-20 years after the end of WWII) and a unique crime-solving team (a native islander who is both a custom priest and a colonial policeman, plus an American nun). The stories do share some ground with other crime fiction series, both East and West. Sergeant Kella shares a man-in-between-worlds point of view with Nathan Active of San Jones's excellent series set in Alaska. 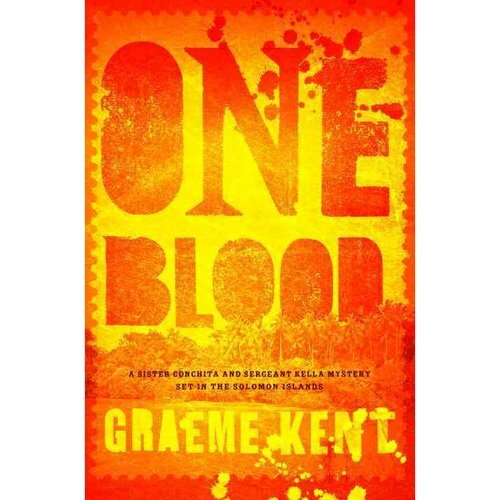 Kent's milieu has the same sort of conenction to the supernatural as Colin Cotteril's Dr. Siri's Laotian series (though Kent takes the other world of the Solomon Islanders a bit more seriously) and Adrian Hyland's Emily Tempest series set in the Australian outback. But the time-frame of Kent's series adds a new element: the British protectorate over the Solomons is about to end, and Sergeant Kella and other native islanders are preparing themselves for independence, some of them with overtly political ambitions. And politics are, indeed, a major subject of One Blood, the new Kella/Conchita book. Kella is sent to the western islands, beyond the protection of the gods of his native Malaita, and Sister Conchita has also been transferred to the west to assist a group of elderly nuns stationed there. Kella is supposed to be investigating sabotage at a logging operation (though he's known for going rogue, in terms of what he looks into) and an American tourist dies mysteriously during the nuns' open house event. The parallel investigations (though that may not be quite the right word) take on an edge of not only Solomons politics but also oft he concurrent presidential race in the U.S., where John Kennedy (who was stranded in WWII in the Solomons when his boat, the PT-109, was rammed by a Japanese ship in the middle of the night) is now in a dead heat with Richard Nixon. Some strangely un-tourist-like Americans are nosing around the islands where Kennedy and his crew took refuge, and Kella also runs into a Solomon Islands Indepenence Party that isn't quite what it seems. Kella isn't really investigating much, though. He talks to the head of the logging camp (after a run-in with its security guards) and mingles with the locals, without making much progress in finding out what's going on. Sister Conchita tries to pressure the authorities to investigate the suspicious death, without much luck, until she and Kella join forces. Even then, though, the plot progresses more through the successive suppositions of the main characters than through any progressive uncovering of evidence. The series is in fact strongest in its characters more so than in its plots. There are a couple of things in the later part of the book that are a little disturbing (though that may not be quite the right word). In pursuit of a trio that he thinks to be murderers, he adopts some tactics that are tactically smart but at the same time quite bloodthirsty. We get a glimpse of his lineage among the marauding headhunters of the islands that is quite at odds with the mostly humane (though certainly ready for a fight) Sergeant. The story does lead to an entertaining comparison, though, between the headhunters of the region and the denizens of various law-enforcement organizations in the U.S.